Whether it's due to the loss of a loved one, divorce, downsizing or relocation, we are there to help take care of your needs. Our goal is to guide you through the process of liquidating the estate as quickly, profitably & painlessly as possible. *Transformation of estates with furniture, art and other treasures into boutiques. Well known for our beautiful displays and creative marketing, we have many followers, which are qualified buyers that join us for each of our sales. *Specializing in the high-end estate sales and can cater to the upscale sales, with our beautiful displays and clientele. *Having attended the National Estate Sales Convention, we have the leading edge in education and technology. *Years of expertise in the antiques and collectibles market, as well as knowing how to price your household items at market value for maximum profitability. We work with appraisers, have relationships with auctioneers, liquidators and specialty consignment stores. *Our Lead Agent, is a successful, Licensed Realtor in the State of Kansas and can help with all YOUR Real Estate Needs. *Business has grown quickly, most of that is due to referrals. Over 90% of the sales are from referrals from past clients. We are humbled and know the referrals are earned. We are ready to earn the opportunity to help……... We have built a reputation for exceeding our clients' expectations for revenue generated and outstanding customer service. When you are ready to move to the next chapter of your life, we are here to help! Please call SHANNON @ 316-641-7755 for a FREE consultation. ESTATE CHIC'S Sale in NW Wichita with Jewelry Galore! ESTATE CHIC'S Sale Offering TOOLS, TOOLS, TOOLS! ESTATE CHIC'S High End Sale in The Moorings! ESTATE CHIC’S Sale in Reflection RidgeStay Tuned...More Details and Photos to follow! ESTATE CHIC'S SALE IN REFLECTION RIDGE Details and Photos to be posted soon...Stay Tuned! ESTATE CHIC’S is the most Organized and Professional Service for Estate Sales in the Wichita Area. I would HIGHLY recommend them for all your needs. Looks like a boutique, its so well organized and put together. Customer service is outstanding and obviously a priority. Definitely the #1 Estate Sale Company in the region. Always look forward to seeing those bright pink signs. No other estate sale compares! Honesty and integrity – that’s what Estate Chicks is all about! 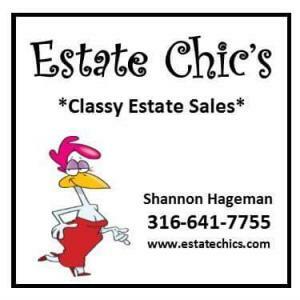 Not to mention Estate Chicks sales are the most organized and fairly priced estate sales in Wichita and the surrounding area. Absolutely loved working with them.